There are four men with Wyoming ties in the College Football Hall of Fame, but three of them are coaches and really only one of those (Bowden Wyatt) is in the Hall for his work at Wyoming (the others are Bob Devaney and Pat Dye). Eddie Talboom was born May 5, 1921 at Delphos, Ohio. He moved to South Bend, Indiana, where he played football for Bernie Witucki at Washington High School. He was in the military in World War II. 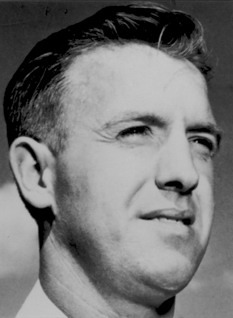 Upon his return to civilian life, he enrolled at the University of Wyoming and played under Bowden Wyatt from 1948-50. He stood 5-10 in height and weighed only 157 pounds. But he starred in the Wyoming single-wing. He ran, passed, punted, and place-kicked. He was Wyoming's first All-America in 1950 and Wyoming's first Hall of Famer in 2000. Talboom scored 130 points in 1950, third in the nation. In his career, he scored 34 touchdowns and 99 extra points. This gave him a total of 303 points. His average, 10.2 per game, was the fifth highest on record in 2000. He passed for 21 touchdowns, returned 10 kicks, and intercepted 2 passes. Wyoming went 9-1 in 1949, 10-0 in 1950. In 1949, Talboom scored 29 points against Colorado State. He led the Skyline Conference in scoring three times. The 1950 Wyoming team beat Washington and Lee 20-7 in the Gator Bowl. Talboom was responsible for all 20 points. Talboom graduated with a major in history. He taught and coached at the high school level. He died June 6, 1998.